Body Attack Essential Aminos 5700 with all essential amino acids and semi-essential amino acids, cysteine and tyrosine. Content is sufficient for use according to our recommendation for 30 day(s). 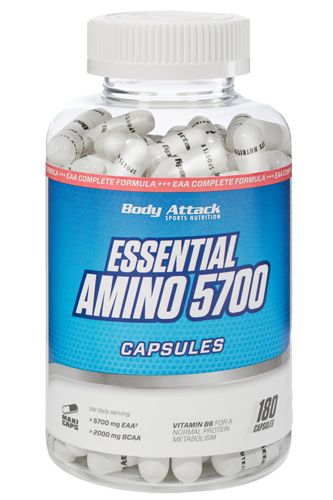 The Body Attack Essential Aminos 5700 is an amino acid supplement in capsule form that contains all the essential (indispensable) amino acids that can be found in dietary proteins. These amino acids are also referred to as the building blocks of proteins, and are involved in the formation of muscle tissue, conjunctive tissues (skin, cartilage), antibodies, neurotransmitters, hormones, blood cells and hair. In the daily diet, these 8 amino acids are taken largely through meat, fish, eggs, nuts and legumes. A low-protein diet low in animal foods can lead to reduced intake of the essential amino acids. The amino acid supplements made by Body Attack can help provide the body with essential amino acids. It is particularly suitable for people and athletes with an increased amino acid requirement. Besides the eight essential amino acids, the Body Attack Essential Aminos 5700 contains the amino acids L-Histidine, L-Cysteine, and tyrosine, which are required at an elevated protein metabolism in the body. Worth knowing: What are the other effects of the product? A special feature of the Essential Aminos 5700 is the contained vitamin B6, which is often referred to as protein manager. This B vitamin is involved in over 100 metabolic processes and ensures the smooth running of the protein metabolism. It can contribute to synthesis of new blood cells and neurotransmitters, which in turn can activate the metabolism and reduce fatigue. Which products can the Body Attack Essential Aminos 5700 be combined with best? With the Body Attack Endurance Booster, an amino acid / carbohydrate supplement to increase the short and intense athletic performance. Together with the Body Attack Testo Shock, a popular muscle build-up supplement for bodybuilders and strength athletes.